Each player has one ball in the designated area. 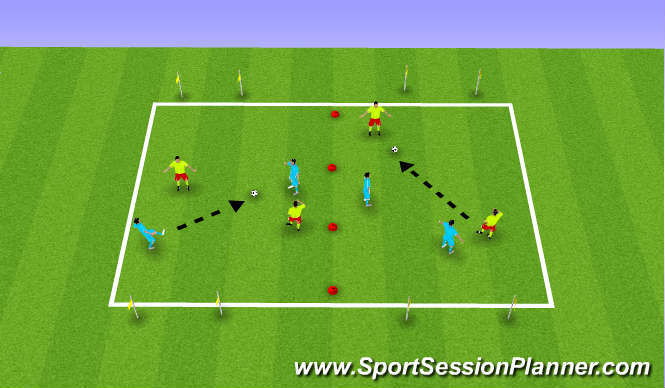 Players dribble freely in open area. They are encouraged to perform dribbling moves and display a change fof pace every 3-5 touches. Coach stands with two bibs and explains that he will award bibs to players putting forth their best effort. The players with the bibs at the end of the warm up are the winners. Every minute, the coach calls out the name of foundation moves -eg. inside-outside, etc, for the players to perform. When a coach calls out a number, players have arrange themselves in groups of that number. 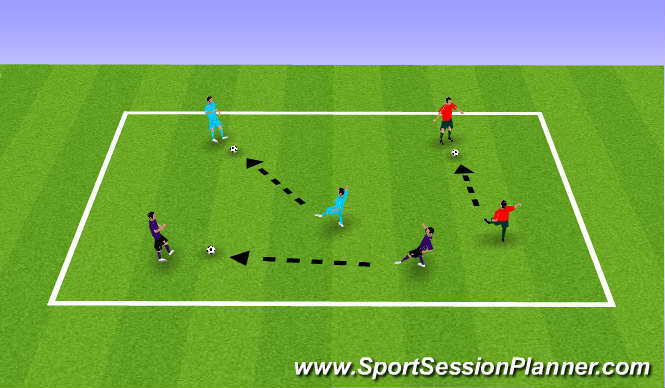 By finishing with the number two the sesssion flows well into the passing and moving exercise that follows. Each player needs a partner with one ball per group. Players pass and move within their groups of two. Upon the coach&apos;s command, the players go from passing and moving into 1 vs. 1 where they fight for posession of the ball. Players&apos;s are encouraged to utlize their dribbling moves worked on in during the warmup to get around the defender. When the coach calls "freeze" whoever has the possession of the ball scores a point. Players pass and move within their groups of two. As they pass and move, the coach calls out a two-player combination command-eg. take over, wall pass, overlap, etc. Players are instructed that when they hear the combination they should attempt to perform it. -In the modern game, players need to play effective short passes with both feet with the following surfaces-inside, outside, toe, heel, lace. Encourage players to cycle through all of the surfaces to gain experience with each. -Encourage the players to recognize that the game has a rhythm and that part of learning to read the game involves not forcing combinations when they are not available. 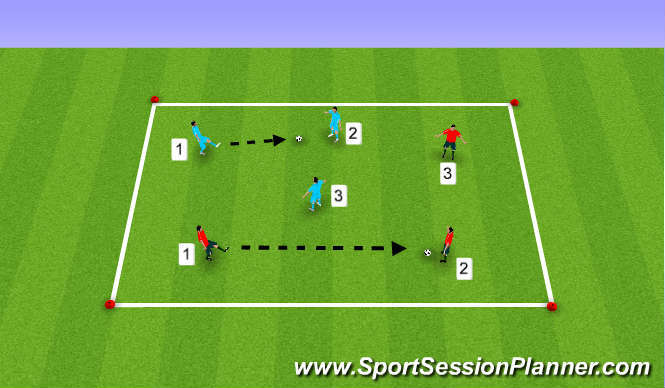 This exercise can be a good starting point to get players to be patient and too keep the ball moving until the moment arises. Arrange the palyers in groups of three and assign each player in the group a number (one, two, or three). Each group will need one ball. Each group passes and moves in an open area until the coach calls out a number. When a number is called out that player becomes the defender, while the remaining two players become the attackers. The two attacking players score by getting the ball to one line and then to the opposite line. If the team scores or the defender wins the ball, the group begins passing and moving again. A team gets two points if they incorporate a two-person combination to score. First player to five points wins. Arrange the players into two teams of two. Each team will attack and defend one goal. The teams play 2 vs 2 trying to score by dribbling through their goal. First team to three wins. -The teams score by passing through the goal. -A goal is worth two if it includes a two player combination. Remove the center line and play 4 vs 4. to four goals.